We've suggested that quick stops are a primary defense against collisions, discussed some basic braking dynamics, described how to practice quick stops and reviewed some special braking situations. Now let's consider the different braking systems that have been designed to help get the bike slowed without causing a slideout. In a pinch, when you suddenly need to do a quick stop, linked, integrated and antilock brake systems all contribute in different ways to helping the rider keep the bike under control. Some of us have several different braking systems in the same garage. When switching from one bike to another, it quickly becomes obvious that different braking systems require different techniques. Let's review the various braking systems in a little more detail and offer some advice about using them. 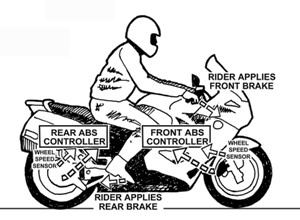 The basic brake system is independent front/rear brakes, activated directly by the rider. Today, most motorcycle brakes are hydraulic disks front and rear, although some rear brakes are drum. The Kawasaki Concourse is typical of a contemporary motorcycle with independent front/rear hydraulic disk brakes. Independent brakes have the advantage of simplicity, lower cost and potentially shortest stops, plus giving the rider options for different situations. For instance, when riding on rain-slick surfaces or carrying a passenger, the rider can adjust brake bias more to the rear brake. When making tight U-turns, or braking on loose gravel, the rear brake can be applied independently of the front. The disadvantage of independent ("standard") brakes is that more rider skill is required to avoid skids. Not only must the rider apply both front and rear brakes simultaneously, but each brake must be modulated to avoid locking the wheel. Tested stopping distance of a 1997 Kawasaki Concourse from 60 mph to 0 is 108.06 ft. Linked brake systems use complex hydraulic plumbing with proportioning and delay valves to activate different pistons in each brake caliper. The Honda Linked Brake System (LBS) uses triple piston calipers on two front disks and one rear disk. Each of the three pistons on each caliper are independent, so activating only one piston produces about one-third of the potential braking force on each caliper. Squeezing the front brake lever activates the outer two pistons of both front calipers, plus the middle piston of the rear caliper. The rear brake pedal activates the two outer pistons on the single rear caliper, plus the middle pistons on both front calipers. Applying the fronts also provides about 30% of rear braking--not so much as to cause a rear wheel lockup. Applying the rear pedal contributes to approximately 30% of maximum front wheel braking. The advantage of linked brakes is that the rider can control brake bias between front and rear wheels, within the limits of the system. At speed, linked brakes help balance braking between front and rear, making front trail braking in corners more predictable. At slow speeds, trailing the rear brake helps control speed without bringing the bike to a sudden stop. Tested stopping distance of a 2003 Honda ST1300 ABS from 60 mph to 0 is 124.3 ft. Integrated brakes also have the front and rear brakes connected together, but in a different way. The Honda Gold Wing is typical. Front and rear calipers are actuated by the "rear" brake pedal. Pressing on the rear pedal activates the single rear brake caliper plus one of the two front calipers. A proportioning valve supplies approximately 70% of brake pressure to the front caliper, and 30% to the rear caliper. Squeezing the front brake lever activates the other front caliper independently of the integrated system. As with independent front/rear brakes, full brake force is dependent on the rider applying both rear pedal and front lever. The advantage of integrated brakes is that the "panic" reaction of stepping on just the rear pedal automatically applies one of the two more-powerful front brakes. The disadvantages of integrated brakes is that the rear brake cannot be applied independently of the front. When making tight U turns it's best to avoid rear wheel braking, and instead feather the clutch to control speed. When stopping on a gravel surface (such as a graveled road shoulder) the brakes must be applied very gently to avoid a front wheel skid. Tested stopping distance of a 2004 GL 1800A Gold Wing from 60 mph to 0 is 121.4 ft. Independent, linked, and integrated brake systems can all be made "anti-lock". Anti-lock Brake Systems (ABS) work by sensing wheel speed, and releasing brake pressure momentarily to prevent the brake from locking the wheel. Each wheel has a sensor that detects the rotational speed of the wheel. A suddenly decelerating wheel indicates the tire is starting to skid. To avoid locking the wheel, the ABS controller releases brake pressure for a fraction of a second to allow the wheel to regain traction, then applies full pressure again to continue the braking. 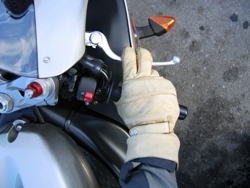 If the rider brakes too aggressively, ABS releases and applies the brakes in rapid pulses. Independent ABS requires a controller for each wheel. Speed sensors at both wheels signal wheel rotation speed. If a wheel suddenly slows down, the ABS controller momentarily releases and restores brake pressure in rapid pulses to allow the rider to brake aggressively without locking the wheels. The tested stopping distance of a 1998 Honda VFR800FI (non-ABS) from 60 mph to 0 is 107.9 ft. The tested stopping distance of a 2002 VFR800FI (with ABS) from 60 mph to 0 is 119.5 ft.
Over the past decade, BMW has produced a number of models with integral power assisted ABS brakes, including the R1150 RT. "Integral ABS" means both front and rear brakes are connected to a single hydraulic control unit with ABS. Most of the BMW integral systems also have power assist. When the rider applies the brakes, electrically-driven hydraulic servo pumps activate, increasing hydraulic pressure to the calipers. In the "Fully-Integrated" system, either the handlebar lever or the foot pedal will command full braking on both wheels. The BMW system also has an adaptive computer that "learns" the rear/front brake bias based on how the bike is loaded. For instance, with a passenger on board, the computer will sense more rear wheel traction during the first stop, and will increase rear brake bias automatically. Although in operation the most advanced integral ABS power-assisted systems are almost "seamless", there are some "quirks" that require additional rider attention. For instance, the brakes should not be applied when starting the engine, to avoid a system fault. The habit of trailing the rear brake in tight turns must be resisted, since applying the rear brake will also apply the front, with the risk of bringing the bike to an unexpected quick stop while leaned over. And the system is very sensitive to battery voltage. BMW subsequently produced a "Partially Integrated" system on some models. In the Partially Integrated system, the front brake lever activates both front and rear calipers, exactly like the fully integrated system. But the rear pedal activates only the rear caliper, not the fronts. ABS is fully functional through the front brake power assist. The advantage of the partially integrated system is that it allows rear-wheel-only braking for situations such as slow speed U turns. After considerable experience with the Integral ABS power assisted brake system, BMW is apparently returning to independent ABS, just as other manufacturers are adding independent ABS as an option on many of their motorcycles. 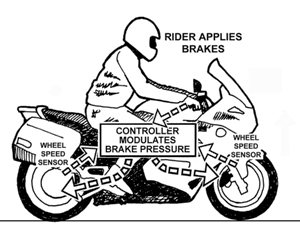 Whatever the brake system on your motorcycle, rider skill is still the most important part of controlling speed. It's important to know when to brake and how to brake. And it's even more important to develop good braking habits, because even the most advanced system can't prevent a slideout caused by poor techniques (such as snapping the throttle closed in the middle of a tight turn). When you are suddenly faced with a hazardous situation, good habits will help you pull off a successful stop without having to think about it.